Archaeopteryx is a Jurassic fossil bird that shares both bird and reptile features; it is widely accepted as the earliest and most primitive known bird. Fossils show the presence of wings and feathers, as in birds, but also teeth (which modern birds do not have), claws on the wings, and a long, lizard-like tail, with tail vertebrate, such as with reptiles (Mayr 2001). The description of the first intact specimen in 1861 (two years after Charles Darwin published The Origin of Species), set off a firestorm of debate about evolution and the role of transitional fossils that endures to this day. Over the years, ten specimens of Archaeopteryx have been found, all in a limestone deposit near Solnhofen, Germany. The fine-grained limestone, which preserves detailed casts of features not often fossilized, is used by artists and printers for lithographic plates, thus the species name Archaeopteryx lithographica. These fossils are attributed to the Upper (or Late) Jurassic period, about 145 million years ago. 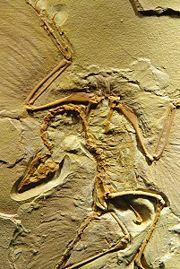 As a fossil that fills a large gap between reptiles and birds, Archaeopteryx has been referred to as a missing link (Mayr 2001). At one point, it was also widely considered a direct ancestor of modern birds, but many current paleontologists view it now as a side branch. There are divergent theories on whether birds arose from archosaurian reptiles in the late Triassic, more than 200 million years ago, or from theropod dinosaurs in the more recent Cretaceous, about 80-110 million years ago. The two camps, understandably, view differently where Archaeopteryx fits in the scheme between reptiles, or dinosaurs, and modern birds. Since its timely discovery in 1860 and description the next year, shortly after Darwin predicted such transitional fossils in The Origin of Species, Archaeopteryx has been presented as evidence for Darwin's theory of descent with modification. As such it has gained a great deal of notoriety, not only in scientific discourse but also in textbooks and the public media. Nonetheless, despite the significance attributed to this species, Archaeopteryx does not significantly illuminate possible transitions between reptiles/dinosaurs and birds, since it appears in the fossil record fully formed, with a lack of any transitional forms between reptiles or dinosaurs and itself. The history surrounding Archaeopteryx does reveal, however, much about the process of science, with competing theories espoused by different camps, and at times a tendency to espouse seemingly definitive conclusions beyond that of the known facts. Based on the fossil evidence, Archaeopteryx was similar in size and shape to a magpie, with short, broad wings and a long tail. The feathers resemble those of living birds, but Archaeopteryx was rather different from any bird we know of today: it had jaws lined with sharp teeth, three fingers ending in curving claws, and a long bony tail. It is unclear where Archaeopteryx fits in the evolution of birds. There are two major conjectures regarding the origin of birds. The thecodont theory holds that birds arose from archosaurian reptiles, perhaps in the late Triassic more than 200 million years ago. The dinosaurian theory holds that birds evolved from theropod dinosaurs at an earlier date. Some consider Archaeopteryx to be a powerful piece of evidence that birds evolved from dinosaurs. The skeleton is similar to the dinosaurs of the families Dromaeosauridae and Troodontidae. However, Archaeopteryx also presents a complication in this matter. The most bird-like, bipedal dinosaurs, which are presented as the ancestors of birds, actually trace to the Cretaceous, about 70 to 100 million years ago, or well after Archaeopteryx, the earliest known bird, had disappeared. Mayr (2001) feels that Archaeopteryx, which lived 145 million years ago in the Jurassic, has so many advanced avian characters that the original birds must have existed sometime earlier, perhaps in the Triassic, 200 million years ago. Yet, there have not been any bird-like dinosaurs known from the Jurassic, or earlier. This would offer support for the view that birds arose from archosaurian reptiles. The "Thermopolis" specimen, recently donated to the Wyoming Dinosaur Center in Thermopolis, Wyoming, and described in the December 2, 2005 Science journal article "A well-preserved Archaeopteryx specimen with theropod features," shows that Archaeopteryx lacked a reversed toe—a universal feature of birds—limiting its ability to perch in trees and implying a terrestrial lifestyle. This has been interpreted as evidence of theropod ancestry. The specimen also has a hyperextendible second toe. "Until now, the feature was thought to belong only to the species' close relatives, the deinonychosaurs." There is some controversy about whether Archaeopteryx could genuinely fly, or only hop around and glide from trees. The lack of a large breastbone suggests it was not a strong flier, but flight muscles might have attached to the bird's thick, boomerang-shaped wishbone, a birdlike feature. The large wings and long tail, however, suggest that it was both stable and maneuverable in the air. The shape of the wings is similar to birds that fly through trees and brush. Archaeopteryx continues to play an important part in scientific debates about the origin and evolution of flight. Some scientists see Archaeopteryx as climbing through the trees like a squirrel, following the idea that birds evolved from tree-dwelling gliders (the "trees down" hypothesis for the evolution of flight proposed by O.C. Marsh). Other scientists see Archaeopteryx as running quickly along the ground, supporting the idea that birds evolved flight by running (the "ground up" hypothesis proposed by Samuel Wendall Williston). It was noted in the section above that the Thermopolisspecimen showed the lack of a reversed toe, which is used by birds for perching, and thus supporting the idea of a terrestrial existence. So far, Archaeopteryx has perhaps produced as many questions as answers, and the latest findings on this fossil are unlikely to be the last word. Ten fossils have been found, nine of which are described below. The relationships of the specimens are problematic; most specimens had been given their own species name at one point or another. The Berlin specimen has been referred to as Archaeopteryx siemensii, the Eichstatt specimen as Jurapteryx recurva, the Munich specimen as Archaeopteryx bavarica, and the Solnhofen specimen was referred to as Wellnhoferia grandis. Recently, it has been argued that all specimens belong to the same species; however, significant differences do exist between specimens. In particular, the Munich and Eichstatt specimens differ from the London, Berlin, and Solnhofen specimens in being smaller, having different finger proportions, and in having more slender snouts lined with sharp teeth. These differences are as large as or larger than the differences seen today between adults of different bird species. However, it is also possible that these differences could be explained by different ages. The feather: Discovered in 1860 near Solnhofen, Germany, and described in 1861 by Hermann von Meyer. Currently located at the Humbolt Museum für Naturkunde in Berlin. This is generally referred to as Archaeopteryx, but whether it actually is a feather of this species or another, yet undiscovered, proto-bird is unknown. London Specimen (BMNH 37001, the holotype): Discovered in 1861 near Langenaltheim, Germany, and described in 1863 by Richard Owen, who made it the "type specimen" for the genus and species. Currently located at the British Museum of Natural History in London. It is missing its head. Berlin Specimen (HMN 1880): Discovered in 1876 or 1877 near Blumenberg, Germany and described in 1884 by Wilhelm Dames. Currently Located at the Humbolt Museum für Naturkunde, it is considered the best specimen and the first with a complete head. Once classified as a new species, A. siemensii. Maxberg Specimen (S5): Discovered in 1956 or 1958 near Langenaltheim and described in 1959 by Heller. Currently missing, though it was once exhibited at the Maxberg Museum in Solnhofen. It belonged to Eduard Opitsch, who loaned it to the museum. After his death in 1992, the specimen was discovered to be missing, and may have been stolen or sold. It is composed of a torso. Haarlem Specimen (TM 6428, also known as the Teyler Specimen): Discovered in 1855 near Riedenburg, Germany and described as a Pterodactylus crassipes in 1875 by Meyer; it was reclassified in 1970 by John Ostrom. Currently located at the Teyler Museum in Haarlem, the Netherlands. The very first specimen, despite the classification error. Eichstätt Specimen (JM 2257): Discovered in 1951 or 1955 near Workerszell, Germany and described by Peter Wellnhofer in 1974. Currently located at the Jura Museum in Eichstätt, Germany. It is the smallest specimen, and has the second best head. Possibly a separate genus, Jurapteryx recurva, or species A. recurva. Munich Specimen (S6, formerly known as the Solnhofen-Aktien-Verein Specimen): Discovered in 1991 near Langenaltheim and described in 1993 by Wellnhofer. Currently located located at the Paläontologische Museum München in Munich. Only specimen with a breastbone (sternum). May be a new species, A. bavarica. Solnhofen Specimen (BSP 1999): Discovered in the 1960s near Eichstätt, Germany and described in 1988 by Wellnhofer. Currently located at the Bürgermeister-Müller-Museum in Solnhofen. It was originally classified as a Compsognathus by an amateur collector. May belong to a separate genus and species, Wellnhoferia grandis. Thermopolis Specimen Discovered in Germany. Long in a private collection, described in 2005 by Mayr, Pohl, and Peters. Currently located at the Wyoming Dinosaur Center in Thermopolis, Wyoming. Has the best-preserved head and feet. Alonso, P. D., A. C. Milner, R. A. Ketcham, M. J. Cookson, and T. B. Rowe. 2004. The avian nature of the brain and inner ear of Archaeopteryx. Nature 430: 666-669. Feduccia, A., and H. B. Tordoff. 1979. Feathers of Archaeopteryx: Asymmetric vanes indicate aerodynamic function. Science 203:1021-1022. Feduccia, A. 1993. Evidence from claw geometry indicating arboreal habits of Archaeopteryx. Science 259:790-793. Feduccia, A. 1996. The Origin and Evolution of Birds. New Haven, CT: Yale University Press. Heilmann, G. 1926. The Origin of Birds. London: Witherby. Mayr, E. 2001. What evolution is. New York: Basic books. Mayr, G., B. Pohl, and D. S. Peters. 2005. 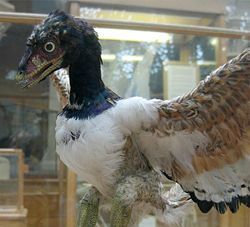 A well-preserved Archaeopteryx specimen with theropod features. Science 310:1483-1486. Olson, S., and A. Feduccia. 1979. Flight capability and the pectoral girdle of Archaeopteryx. Nature 278:247-248. Ostrom, J. H. 1976. Archaeopteryx and the origin of birds. Biological Journal of the Linnean Society 8:91-182. Ostrom, J. H. 1985. “Introduction to Archaeopteryx: The beginnings of birds.” Proceedings of the International Archaeopteryx Conference. Freunde des Jura-Museums Eichstatt: 9-20. Owen, R. 1863. “On the Archaeopteryx of Von Meyer, with a description of the fossil remains of a long-tailed species from the lithographic stone of Solnhofen.” Philosophical Transactions of the Royal Society of London 153:33-47. Wells, J. 2000. Icons of evolution: Science or myth. Washington, DC: Regnery Publishing. Witmer, L. M. 2004. Palaeontology: inside the oldest bird brain. Nature 430 (7000): 619-620. This page was last modified on 29 August 2008, at 13:11.